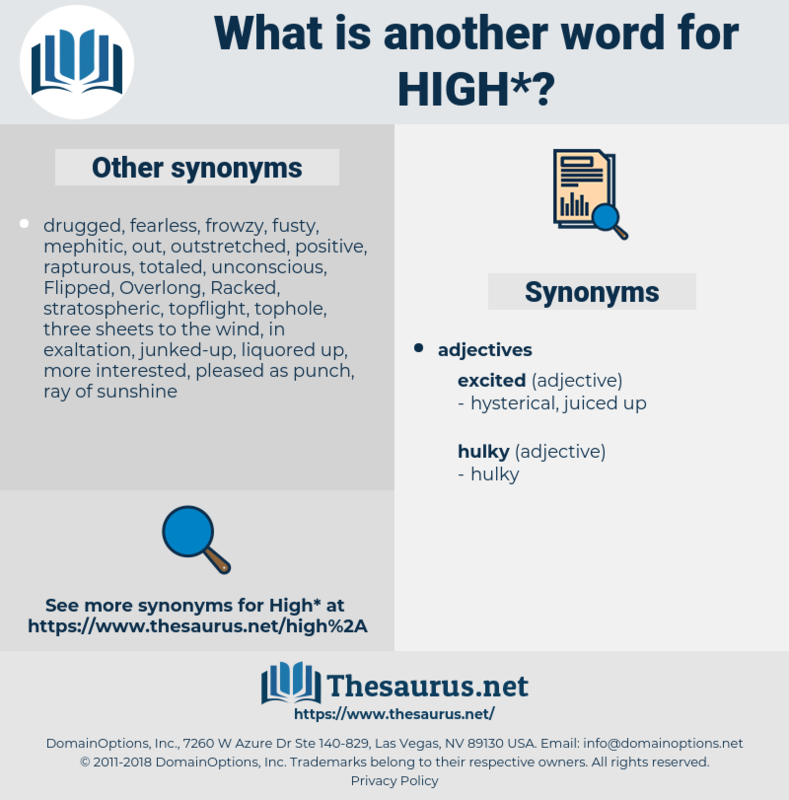 What is another word for high? standing above others in quality or position; " people in high places"; " the high priest"; " eminent members of the community"
lofty, stringent, Heightened, tough, enormous, exalted, prominent, massive, loud, louder, hi-, rich, overwhelming, vast, rigorous, tight, noble, demanding, sophisticated, costly, senior-level, outstanding, immense, sublime, supreme, high-dose, robust, prohibitive, sizeable, widespread, inflated, prevalent, great, overriding, fire-prevention, towering, top-level, high-frequency, prestigious. establishments, institutions, governors, challenges, Plateaux, PROSPECTS, bills, ICs, Studies, elders, sectors, notices, Has, leaps, forces, tops, supreme, great. Grew, Erected, experienced, found, Amounted, fell, kept. 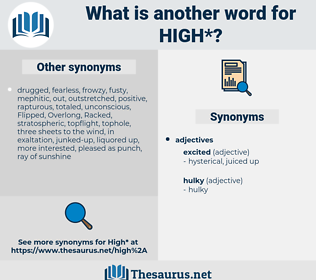 high-quality, exorbitant, high-grade, higher-level, high-altitude, high-value, high-standard, high-class, excessive, high-level, high-priority, high-speed, strict, tremendous, high-risk, high-priced, steep, high-income, distinguished, large-scale, high-yield, exacting, high-pressure, senior. indistinct, bland, tasteless, moderate, common, calm, inexpensive, ignorant, reasonable, mild, stupid, cheap, poor, normal. nonessential, minor, subordinate, secondary, trivial, unnecessary, inessential. little, depressed, short, miniature, weak, tiny, teeny, inferior, soft, sober, down, small, minute, insignificant, unimportant, upset, humble, lowly, ground, worthless, dishonorable. mean, Dwarfed, rock bottom, stunted, fragrant. I didn't reply to this, but I put on my high boots. High above us it rose.